These two combo tech/personal tote bags are almost identical in size and shape. But they are constructed from very different materials, and one is almost double the price of the other. Which one should you get, and why? More important is why to consider using a tech tote in the first place. Tote cases are versatile. They don’t look like techie luggage, and are less “steal me” obvious than many carrying cases. The straps can be held in your hands or slung over your shoulder. Flat bottoms allow totes to stand tall and proud, without flopping over and damaging your equipment. Well-constructed tote cases last for years or decades, and don’t lose their primary purposes when their outsides become worn and scratched. Over time they are like good friends who don’t demand much in return for loyalty and reliability. 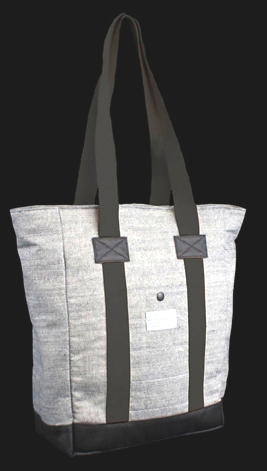 The HEX academy 15″ laptop tote is constructed from “premium waxed reverse denim shell, surplus grade cotton webbing, genuine leather zipper pulls, [and] custom logo lining.” In other words, gray fabric exterior, black fabric straps, red and black padded interior, and black rubbery bottom. It is stylish in a minimalist, inconspicuous way that won’t turn heads or widen eyes. A single velcro strap secures a 15″ MacBook Pro slid vertically into the dedicated computer pocket. A tiny velcro patch closes the custom iPad pocket. A modest organizer has two iPhone-size pockets and two pen/pencil slots, plus three smaller mini-pockets. Into the main compartment you place your additional personal and tech gear: cables, clothes, food, books, and/or anything/everything else you want and need to carry. When you zip the top shut, a substantial opening at each end of the zipper allows rain to soak the contents within the HEX. Its wide fabric handles are easy on the hands and shoulders. Its bottom is flat and stable. The HEX academy 15″ laptop tote doesn’t weigh much itself, so you decide how heavy it is when you place your gear into it. With a 15″ computer, plus accessories, this and all similar totes become heavy rather quickly, so plan ahead if you’ll be dragging it across O’Hare Airport from one terminal to another far away. For casual use in good weather this is a good product at a reasonable price. For demanding use in lousy weather, get something else. My wife wants to use a HEX tote as a summer picnic carrier, with plates going into the laptop sleeve and her iPad into the dedicated sleeve. Silverware will fit nicely into the two smaller pockets. MyMac Review Rating: 7 out of 10. 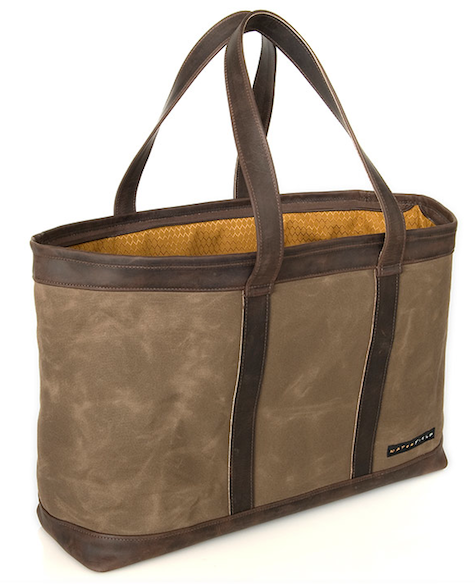 Waterfield Designs’ Outback Tote comes in two sizes and two trim colors. The large size is a better value, but with its extra carrying capacity comes additional weight when fully loaded. Compared to the almost weightless HEX tote above, the Outback Tote is noticeably heavier when empty. Our review unit is the small Daily model with “chocolate” leather trim and handles. The primary exterior material on the Outback is a waxed canvas that is thick and rugged. Trim, bottom, and handles are matched colors of hearty leather. Interior lining and pockets are constructed from high-quality gold rip-stop nylon. The top zipper closes the tote fully, protecting the contents from all possible intruders and raindrops. An open iPad pocket is on one interior panel. The other interior panel contains two medium-sized open pockets and a zippered larger pocket with two open smaller pockets within it. There is ample storage for all tech and personal gear, but if you want to place your laptop computer inside an Outback Tote, Waterfield will gladly sell you a custom matching sleeve for $49. Style is subservient to function and design at Waterfield. Outback is a classy product that says a lot about the owner without calling attention to itself. All Waterfield products are hand made in San Francisco, FYI. There is only one potential drawback from a usability point of view, and that is the chubby and dense leather on the grab handles. At first, unless you have the hands of a welder or pipe fitter, these handles will be your adversaries. Over years of use, they will soften and fit comfortably into your palms. MyMac suggests Waterfield redesigns Outback’s handles to make them softer and easier to carry for long distances, right out of the factory. MyMac Review Rating: 8 out of 10, if you have large and strong hands. Waterfield’s Outback is the superior tote, but it may not be your favorite. Its value is substantial, as is its weight. If you like rugged canvas and leather styling, the Outback will appeal to you. Don’t let the higher price tag dissuade you from considering it. The fully-closing zipper top is an important necessity. The HEX academy has lot to recommend it: price, low-key styling, and comfy handles, plus an interior laptop computer sleeve. If you live in Yuma, Arizona, with annual rainfall of 3″, don’t lose sleep about the exposed edges of the zipper top. HEX should fix this problem immediately. Both these tech/personal totes receive our recommendation. You have the facts, so your informed decision will depend on which strengths and drawbacks each product has, relative to your requirements. Choice is good. So are the companies: HEX and Waterfield. The exterior fabric on all HEX Academy bags is designed to be water resistant, so users can take their bags out in the rain and their tech will still stay safe. We haven’t had anyone comment about the openings on the side of the tote bag’s zippers, and none of the samples we’ve seen at our offices have openings that are “substantial.” The openings should not allow a significant amount of rain (if any) to get in.